Our Corporate Accounts Team can leverage your volume to provide competitive pricing and lowest in-use cost, throughout your organization, regardless of geography. The industry’s leading professionals will perform a thorough survey of your business operations, and create a custom solution that supports your business goals. 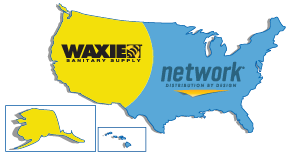 As a partner of NETWORK WAXIE is capable of utilizing distribution facilities throughout North America. Our customers have full access to highly skilled professionals and state-of-the-art information systems that provide realtime purchasing information. NETWORK offers deep experience, vast infrastructure, customizable programs and best-in-class products — including environmentally preferred solutions designed to help customers meet their sustainability goals.